Here are some of the recent phone problems that have come into us on the computer support desk. Can I refer everyone to one of my previous posts about recovering files from mobile phones. I’ve just found this website on google after searching for data recovery companies and am very much hoping you can help. I had my Huawei phone charging in my laptop. I heard it play a start up tune which I had never heard it play before. I looked at the screen which read ‘Internal storage damaged‘. I tried taking the battery/sim/sd card out but to no avail. Two options are given on the device when I turn it on now: to restart the phone (made no difference) and factory reset (I am reluctant to do so as I do not want to lose any data which I may potentially be able to get back). Is this something you can help with? My main concern is getting the data back (sms/whatspp/notes/saved web bookmarks/contacts/pictures etc) but getting the phone working again would also be a bonus. I have an iPhone 5s which has been thrown on the floor and the screen has disconnected from the base. i have tried plugging it into my macbook to recover the data but the device is not being recognised. the main thing i want to recover from the phone i the pictures. would this be possible? I dropped my phone into water, it is not turning on and I would like to retrieve my photos is possible! The “Unmountable Boot Volume” error message is seen when there is a corruption to the computer’s filesystem. 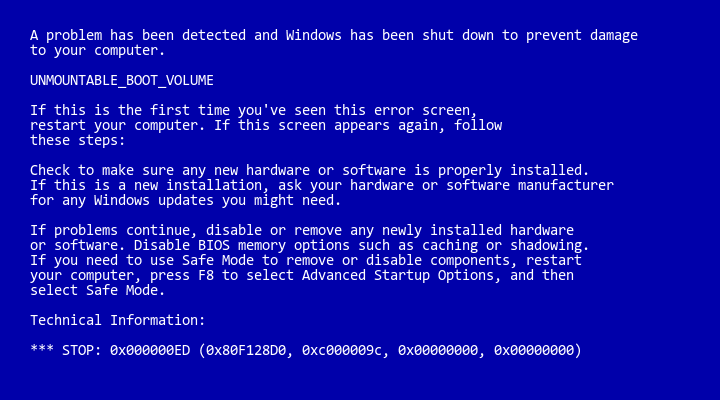 It’s an error message that’s only seen on Windows machines and concerns the FAT32 MS-DOS file and operating systems. The laptop has failed, with the error unmountable boot volume, and gives a code on the HP diagnostic page, that refers back to Hp and gives error, harddrive failure, Can you do anything for me to retrieve all the data off it ? In this condition, The laptop has a 2TB drive installed, and i can supply a 2TB drive to store retrieved info on to it. Possible bump caused the drive arm to lock out. This is what I was told in a local shop. Need to know how much it will cost to recover. I have a LaCie external hard drive that I think has been knocked. It won’t power up (Power LED doesn’t light). I’d like to either have it fixed or have the data transferred to another HDD which I can provide. There is less than 500GB of data. I’ve been quoted GBP 350 as a recovery price which I think is too expensive so I’d like to get your estimate. I need the whole volume back, it’s my boot drive. I have a Hitachi xl2000 2.0tb external hard drive that I hope you can recover. It was knocked to the floor by accident and started clicking when I powered it up so I immediately turned it off – the screen says UNMOUNTABLE_BOOT_VOLUME. I took it to a local “specialist” who took it apart and said they cannot recover it. I needed to send it away to another “specialist” … I received it back in bits and am now so anxious all my photos are now gone. And they are old sentimental ones. I have a mechanical problem. The disk spins in an unusual way. Power seems to be ok. My computer doesn’t mount the drive. 120GB 2.5″ external hard drive, is in casing, fell on floor last year, intact but won’t boot/mount as expected on my machines. MS-DOS/FAT as I recall.